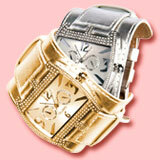 In its distinctive stainless steel case, the Delanicci Extreme is set with 204 sparkling stones. 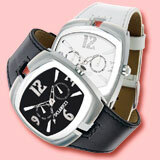 Choose from a range of colours, all come with a comfortable leather cuff. Thanks to a rectangular two-tone stainless steel case, the Delanicci ‘Brava’ range is robust, reliable and rugged... pretty, perfect and available in pink, white or black.